Reduce runoff volume and improve water quality, replicating natural hydrology of the site. Direct support of technical goals. Note: ranges of LEED credit points include all specialties (New Construction, etc.) within a given rating system (BDCv3, etc. ); highest point total may only apply to certain specialties. GGlobes 3.2.3: 5 or 10 pts. BDCv3 SSc6.1: 1pt. ; SSc 6.2: 1pt. NDv3 GIBc8: up to 4 pts. BDCv4 SS Rainwater mgmt. : up to 3 pts. NDv4 GIB Rainwater mgmt. : up to 4 pts. Rainwater management in LEED v4 combines quantity control and quality control which were separate in previous LEED versions. Using green infrastructure and low-impact development approaches, the goal is to replicate natural site hydrology in the design of site elements. PICP are well recognized as a proven strategy that manages rainwater where it falls, allowing it to infiltrate the underlying soils, and controlling any runoff beyond the capacity of the soil. Quantity control: The pervious surface and base structures of PICP create typical water storage capacity 30% to 40% of the total volume of the base and sub-base. This water is allowed to infiltrate into the soil usually within 24 to 72 hours. Water that does not infiltrate can be filtered through the base before draining through perforated pipes in the sub-base. The ICPI manual on permeable pavement notes that the long-term conservative pavement surface infiltration rate is approximately 3 in./hour (210 l/sec/ha). This rate will easily accommodate 2-year, 24-hour rainfall intensities given sufficient base storage and soil infiltration. Permeable interlocking concrete pavements can reduce runoff to zero for the most frequent storms. 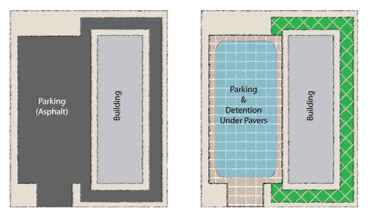 PICP can maximize the percentage of pervious surface area by combining parking with runoff detention and by utilizing grid pavements for auxiliary parking and fire access lanes.